TURRIS LIBYSSONIS, the only Roman colony in Sardinia, was founded in 27 BC, there is evidence in the Turrisromana of extensive ruins of three major spas on the west of the old railway station. At the entrance of the excavation area, where it is going to rise into a major archaeological park, is an Antiquarium with more important findings. Turris Libyssonis was the capital of the Torres held until the decline also caused by the invasions of pirates, which favored the growth of Sassari. Nowadays it is a town with about 22,000 inhabitants located on the northwest coast of Sardinia, in the center of the gulf of Asinara, and represents one of the main doors open to Europe. 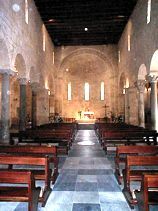 The church is dedicated to the city and San Gavino and this is the most important Romanesque building in Sardinia and one of the largest in Italy, surrounded by picturesque cottages in the North Atrium of the so-called Comita. The imposing building with three naves has no side but has two opposing apses; it was the ancient cathedral of the Judicature of Torres until the middle of the fifteenth century. The church was built in 1050 by workers of Pisa and completed in 1117. Since the beginning of the nineteenth century the news concerning Porto Torres dealing essentially with the port that was just flourishing when, in 1504, it was declared a free port, without this measure, it produced an increase in traffic and trade. In 1627 the city was the victim of a barbarian excursion, after which the King offered the following year, to fortify the village of San Gavino and then he abandoned the project and ordered the inhabitants to move to a safer place. In 1756 Charles Albert III ordered the complete restauration of the dock and in 1765 the work was completed with the creation of two piers that surrounded a square area of water of about 5 acres. In 1831 it was suggested the transfer of all the dock equipment to Asinara or to Porto Conte. Now however, around the old warehouses, the Basilica of San Gavino was forming a reality that went way beyond the simple village of fishermen and farmers, that would soon make its voice heard in open conflict with the city of Sassari. 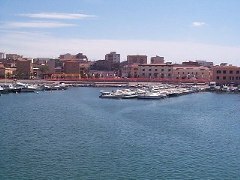 Under the Piemontese government Porto Torres began to take some advantage of it’s geographical position, especially for its proximity to Nice and Genoa. The intensification of relations with the continent, the development trade and the completion (in 1824) of the road “Carlo Felice” that connects Cagliari to Porto Torres, spurred the renaissance of the city. 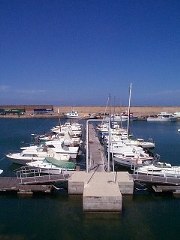 The port of Porto Torres is one of the most important of the Island and provides links to Genoa,Toulon, Marseille and Ajaccio. 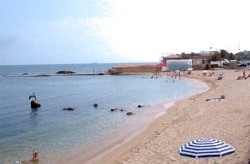 to attract the attention of tourists, besides the immense archaeological and architectural heritage that Porto Torres offers, it certainly helps the enchanting coastal Balai, the inlets of Rinaredda, along the Scolglio Lungo and the waters and cliffs that stretch along the blue sea taking characteristic shape that are well suited to be frequented by swimmers as they do not present difficulties to access them.